It wasn't just for Brittanies. The club hosted a nice turnout of pointing dogs. Veteran dogs know how to relax at organized events - they've seen it all a hundred times. Yes, Gus is a Brittany - of the French flavor. 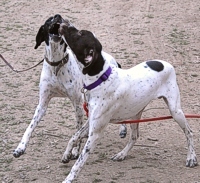 His three-color markings are bit of a departure for US breeders, but it's part of the French standard. He's certainly striking. A staked-out Brittany turns from his spot on the chain gang to eyeball the eyeballers. 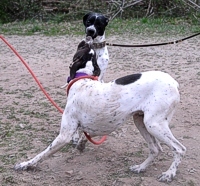 Meena and Rough - 9-month-old littermates - reuinte on the hunt grounds, and pick up where they left off last time to blow off some steam. OK, you two. Save some of that for the Junior course! Dune, a big Weimaraner with a Senior title, works the Master bird field. Billy, Dune's handler, looks over the immediate cover as he walks up to his dog on point. Dune got his first Master qualification after some challenging backing and bird work. 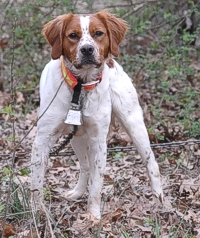 â€¦ and bounds past a gunner during a boisterous quail retrieve. Shelby, a shorthair, exhibits considerable poise as he honors another dog's work in the Master field. He can just see the action through Sorghum. Note that one judge is watching Shelby, and the other is watching the other dog work. Much can be said about the terms "sportsmanship" and "gentleman," but they still mean something. Keith thanks a gunner and his fellow handler for their contribution to Shelby's latest Master qualification. Ah, the Junior back course. Judges are used to seeing the first couple hundred yards from the breakaway turn into puppy social time. Things always change once they get to the bird field. One of the perks of being Brittany-sized is the inevitable hoist up to the better viewing angle. 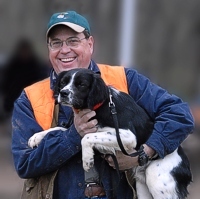 This handler's smiling for the photographer, but his dog cannot tear his eyes away from the Junior bird field, where a brace is working.